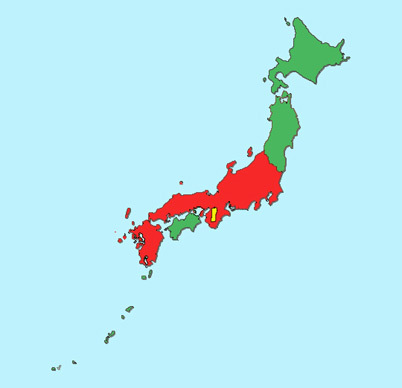 The Yamato Period, commonly broken into two separate eras: the Kofun (“tumulus”) Era, from 250 to 538, and the Asuka Era, from 538 to 710, saw the emergence of a central governing power in the west of Japan, centered around the Yamato Province (highlighted in yellow on the map). It was in this location that a local clan (also known as Yamato) began to consolidate its power and establish its claim as the imperial bloodline of the nation. The native religion, Shintō, was already in full flower, and its mythology was woven into Yamato claim of suzerainty. The areas in red indicate the boundaries of Yamato culture as well as political alliance and administration. It was during the latter half of this period (the Asuka Era) that Buddhism, Chinese writing and other mainland Asian exports arrived via the Korean kingdom of Baekje (Paekche). Prince Shōtoku (574 – 622) promulgated the Seventeen Article Constitution during this time, and the Asuka Era also saw established the Taika Reforms and ritsuryō system, a formula of laws based upon Confucianism and Chinese legal standards.